I’m making some progress in challenging my chronic migraines, Adult Onset Stills Disease and Fibromyalgia. It’s been a 12 year battle and it’s far from over, but I’m still moving forward and that’s been one of the keys to success, trying to wake up each morning and live the best day I can. I’ve been incredibly fortunate to have great emotional and financial support from my employer in my fight, but I’ve also put a lot of effort in myself. I wish I could say I’ve had great support from my doctors, but unfortunately they’ve created as many problems as they’ve improved. This post is my attempt to summarise the approach that I’ve taken and it will link to articles that go into each area in greater depth, some of these articles already exist and others I will be writing as part of the series that this post serves as the introduction to. Many blog posts of this sort cover only the good side of the challenge, the progress, the motivation and inspiration. I’ve decided to also cover the dark side too, some of which still lingers in the background ready to creep back into my life at the next flare. So enough of the introduction and on to how I’ve approached the challenge. Important — this article summarises my personal approach, it might be of interest to others, but it’s certainly not a prescription for success and I’m not qualified to provide medical advice to others, so read with that in mind. What follows is a rough draft of topics that I want to write about, with links to existing blog posts that are relevant. Over the next few weeks I will be working through each topic, writing new posts and adding content to old ones and tidying up the content of this post. Name and embrace the illness. For the first few years of Still’s Disease I had no diagnosis, it was a very difficult time. Then many years later I developed a set of chronic symptoms that had no real diagnosis, so they called them Fibromyalgia, again this proved helpful. Once I had a diagnosis and accepted the realities of being ill I could have a sensible discussion with my doctors and employer and start to move forward. Keeping working. I found it very difficult to keep working at first and I still have a few days a month when I’m ready to quit. No matter how hard it it though work provides purpose, social contact and finances that are hard to obtain in other ways. Although I’ve retired now I’m pleased that I kept working as long as I did. Make health my first job. For most of the last 12 years I considered work to be my primary job and this was an endless struggle. I felt like I was walking a tightrope every day, always ready to fall. Then I realised that I needed to make my health my primary job and work became an important but secondary activity. Most times now when a conflict arises I will choose health. This was a real breakthrough. Making progress. With my kind of health challenges making progress is tricky. I can work for months to loose weight and put it all back on in a weeks flare, I can work every day to develop my fitness for a year and find myself worse than a sedentary colleague. My approach is just to wake up every day and try and live the best day I can. That might involve walking a mile, when the day before I could walk 5, or swimming 5 lengths when the day before I could swim 50. It doesn’t matter, it’s not about goals, it’s about moving in the right direction. Break over reliance on medication. A lot of my chronic problems I now attribute to the medications I took early on. All those antibiotics, steroids, PPIs, NSAIDs and Codeine seriously messed up my gut, then all the pain meds led to chronic migraines, the years of steroids messed up my memory, the list goes on. It’s taken many years to gradually reduce the meds and rebuild my health from the ground up, using the approach detailed later in this guide. Dealing with the stress. Just dealing day to day with the pain, fatigue and uncertainty is stressful enough, but add on work and worries about the future and I’ve needed to develop some serious stress management tools. Exercise, mindfulness, sleep, Yoga Nidra and meditation have all played an important part. Dealing with the pain. Daily pain saps my energy, and willpower, both key to driving improvement. Resorting to pain killers creates more problems than it solves. After many years I’ve found a few things that work. Distraction, movement, mindfulness meditation, hot baths, acceptance and medications to help me get to sleep. Dealing with the fatigue. The greater the level of fatigue the more important it is to move and rest, in equal measure, it’s as simple as that. Dealing with the migraines. Oh the migraines, the worst of all my problems, it’s so easy to pop a pill today, but then they will be worse tomorrow. Having the discipline to not take the pill and to find another way through has been a multi-year challenge that’s not yet won. Dealing with the bad days. Waking up and realising it’s going to be a bad day can be crushing, but even on bad days I live the best day I can. I open up my list of all the things that trigger cycles of decline and improvement and I try to not do too much of the bad stuff and as much of the good as I can. No matter how badly I do, I’m moving in the right direction every day. Of course some days I do just watch TV and each chocolate, but being kind to myself on the bad days has its place too. Everything in moderation including moderation. Dealing with the good days. Some days I’m pain free, occasionally some weeks, and once every few years a month. These good spells can be a real challenge. I’m euphoric, every simple thing in life is such a joy, I have so much pent up ambition and energy that I go crazy at work, over-committing left right and centre, I pay less attention to living well. It never lasts, I come crashing down. It’s taken a long time for me to live the good days the same way I live the bad ones, focussed on my primary job of living the best day I can, living well, building up my resilience, my reserves, ready for the next bad spell. Dealing with uncertainty. Not knowing how well I will be in a few hours time, when I wake up tomorrow, when I’m going on holiday has been so difficult for me. Not knowing how I will support my family in a few years time, how I will survive if I’m made redundant and can never find another job. I’ve been caught out hundreds of times, out walking and unable to get home, travelling and then stuck in a flare, struggling through an important presentation with a migraine, running a week long workshop and hardly able to walk from room to room. Every time I was caught out the stress and anxiety about it happening again built up until it was too much for me. Now I’ve developed three main strategies, stop doing customer facing work because the risk of a bad day is too great, only do time critical work related activities in exceptional circumstances, travel to places I know well and try and go with other people. I still take some risks, like hiking, but I know I can push through the pain for a few hours if needed and I take emergency gear. Building my resilience. The need to build resilience up during the good days has been a key strategy. I do a lot of research on the good days, so that I’m well prepared for challenges at work. I do a lot of exercise and eat an exceptionally nutritious diet. When the bad days strike I’m prepared. I also work hard to minimise infections, which eliminates one of the major triggers for flares and I try to prepare my mind. The power of sleep. Sleeping well is both the most elusive and important area for me. If I don’t sleep well even for a single night, I’m nudged in the direction of a vicious cycle of decline, but with the pain and migraines it’s always a struggle to sleep so in the end I relented and take meds to help me. The power of nutrition. I’ve come to believe that only the highest levels of nutrition, combined with a focus on eliminating toxins are appropriate for a body that’s under the daily pressure that mine is from stress, pain and all the exercise that I try to do to manage both. The power of movement. After sleep moving is of critical importance to me. For every hour I spend sitting I try and spend an hour moving, spread as evenly as possible throughout the day. Even better is a 1 hour sitting, 2 hours moving pattern but I can’t do that on work days. Even when I’m flaring I try and keep moving, even if it’s only 10 minutes in every hour. The power of the mind. We are what we think, so it’s important to train the mind to be resilient, relaxed and positive. It’s hard to be positive all the time of course and that’s where the resilience comes in. Long term planning. Although there’s a lot of variability in my life I’ve found it very comforting to have a long term plan, to know where I’m going and move in that direction every day. Some days I’m pushed backward, but I’m still pointing in the right direction. Short term living. Living with chronic illness I’ve found it most useful to live mostly in the moment, finding joy in the small things in life, focussed on living the best day I can, and planning for the week. However I have a few anchor events in my diary, for example I take a weeks holiday every month and I work hard to make sure I’m well that week, by paying more attention to resting the week before and recovering the week after. 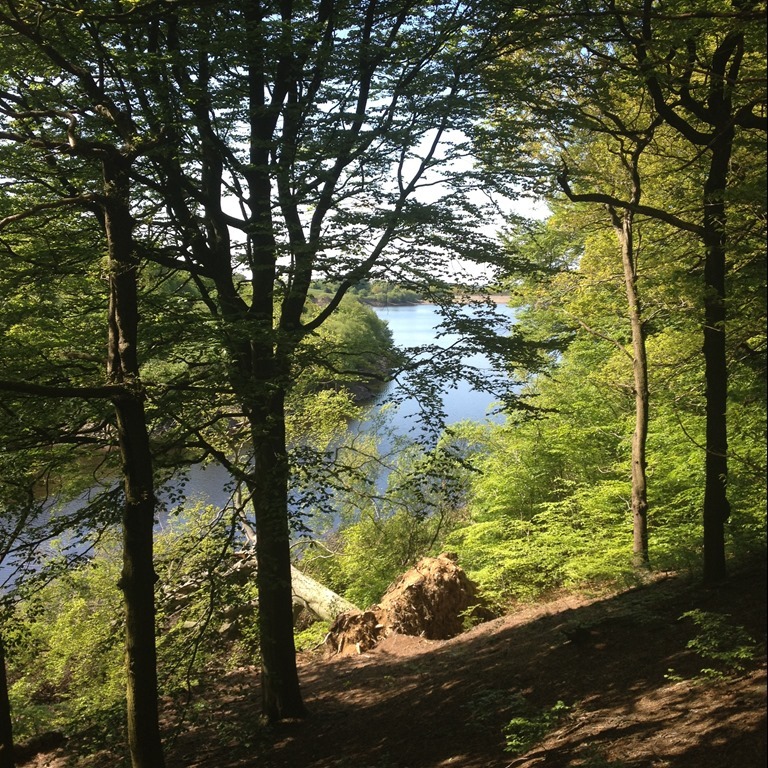 The photo that accompanies this post is one of my favourite walking spots in the local area, the Rivington reservoir system. walking has been the foundation upon which I’ve rebuilt my life following the onset of the chronic illness’ that are the ‘inspiration’ for this post.